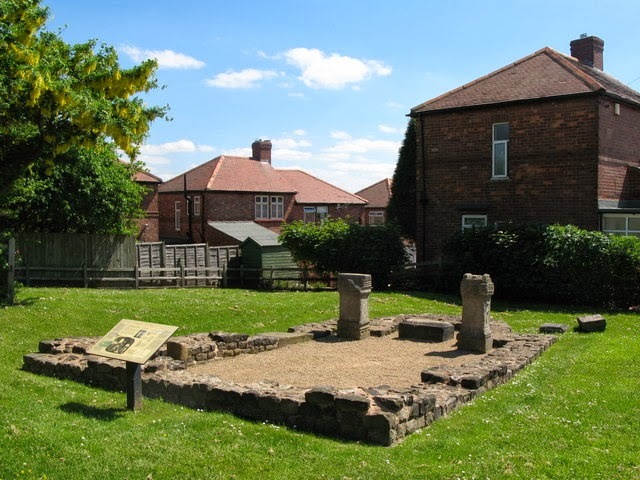 Situated somewhat conspicuously slap-bang in the middle of a housing estate in the western suburbs of Newcastle-upon-Tyne sits a fascinating relic of the region’s rich Roman past – in fact there are two of them within yards of each other. Hardly surprising, though, as the spot sits immediately south of the course of Hadrian’s Wall. 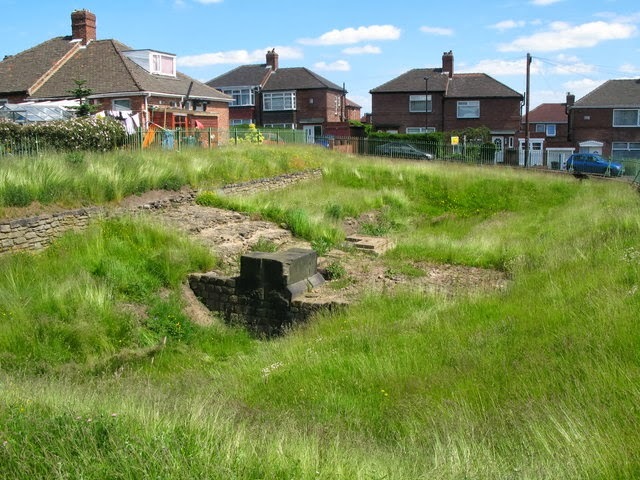 The first is Benwell Vallum Crossing, being all that is left of the ancient roadway which passed over the ditch and bank system at the southern side of Condercum Roman Fort – though nothing of the fort itself remains. Amazingly, for all that we have left of the Roman frontier, this is the only remaining example of its kind which has so far been found. It is nothing much to look at, really, but the footings of the former archway can still be clearly made out – and the landscaping thereabouts maintains its ancient form, enabling the casual visitor to easily imagine its former appearance. It was probably built early in the wall/fort’s history (early 2nd century), and continued to operate until at least the late 3rd century. A short walk to the east sits what remains of a Roman temple, which would have been situated just outside the fort in the civilian settlement, or vicus. Once more, the ruins have been reduced to nigh ground level, but it is easy to discern the building’s outline – and again presents a curious throw-back amidst modern-day surroundings. A couple of replica altar stones help those of us with little in the way of imagination. The structure, dedicated to local god Antenociticus, was built around 178-180AD. Skeletons were found on the site in the 1930s, and Anglo-Saxon goods have also been unearthed nearby. This document gives you a nice idea of the lie of the land and the position of the remains. 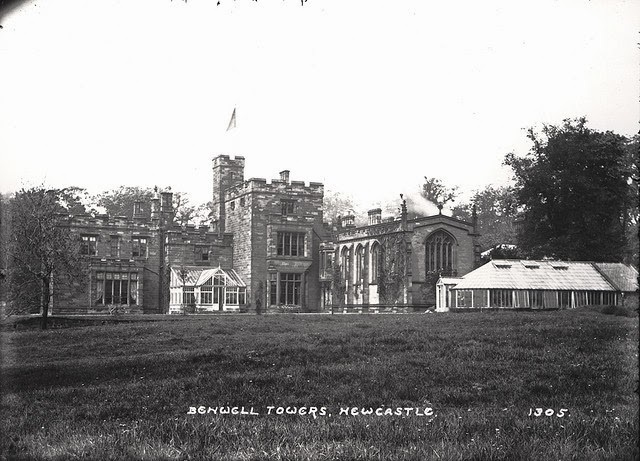 In the long centuries before the village of Benwell was swallowed up by the sprawl of Newcastle, the previous incarnations of the grand old building existed as far back as at least the early thirteenth century. This original erection was a three-storied tower house belonging to the priors of Tynemouth – and with it there persists all sorts of rumours of underground catholic escape tunnels! All goes quiet until the 16th / 17th centuries, when a manorial wing was added to the tower. Further additions and alterations followed in the eighteenth century – the work of the building’s long-term owners, the Shafto family – during which time the great landscape gardener, Lancelot ‘Capability’ Brown, may have had some input. In the 1770s the manor house changed ownership and ultimately suffered for it, falling into general decay by the early 1800s. Colliery owner, Thomas Crawhall, took possession at this time and decided on a complete re-build, turning to famous local architect, John Dobson, for inspiration – all of which led to the pleasing asymmetrical hotch-potch of masonry we see today. In 1882, the site entered another phase of use, being gifted to the religious authorities as the bishop’s residence for the newly-created Diocese of Newcastle. In fitting with its new-found status, a fancy new Perpendicular-style chapel was added. During WWII, the building was pressed into service as a fire station, and, thereafter, as a training centre for the National Coal Board from 1947 (including the HQ of the mine rescue service). For many years the edifice was known widely as The Mitre public house and restaurant – the writer spending his underage drinking years there in the early 1980s. Only after its closure as a pub did it achieve national fame via Byker Grove, Ant and Dec et al. After a decade and a half’s use at the hands of the Beeb it once more fell into disuse, its owners finally putting it up for sale a few years ago. It has recently found yet another new owner and seems destined to reopen as an Islamic school and community centre in the near future. All in keeping with its eclectic history, I suppose. In memory of the 38 men and boys who tragically lost their lives in the Montagu View Pit Disaster on 30th March 1925, when an inrush of water from a burst seam flooded the mine shaft. The pit was finally closed on 13th November 1959. 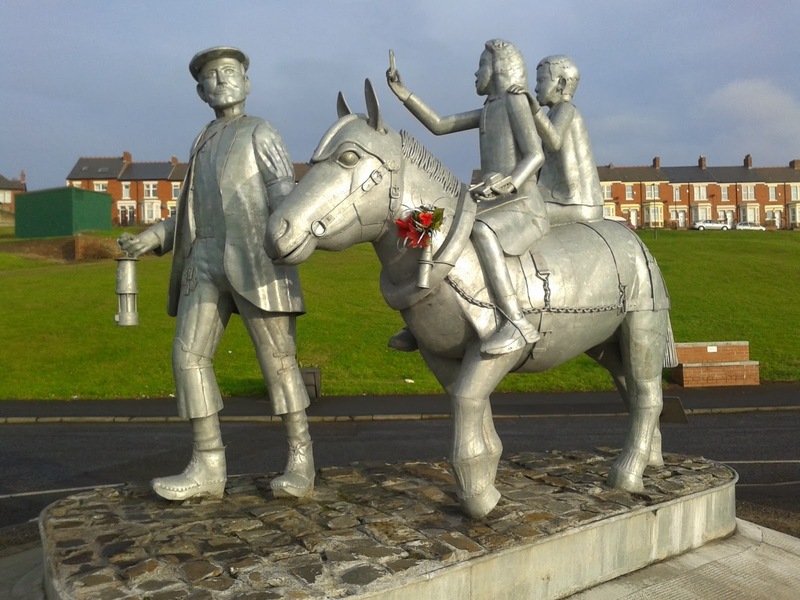 The pitman, pony and tank [the latter is held in the girl’s hand] depict our past heritage. The house [held by the boy] represents the present regeneration of our community. The children are our future. The official unveiling took place on 9th June 2012 by Councillor Hazel Stephenson and children from Scotswood Village Nursery, Scotswood Village Playgroup and Bridgewater School. The children and local community were involved in the design. The sculpture was made by Xceptional Designs. In remembrance of ‘Men of Steel’. Opened in 1842, and still largely intact, the Victoria Tunnel runs for some 2½ miles under Newcastle city centre – from Spital Tongues in the north-west to the Ouse Burn’s confluence with the Tyne in the south-east. It was built by Porter & Latimer, the owners of Leazes Main Colliery, over a three year period as (believe it or not) the most cost-effective way of transporting coal from their main pit-head to the river for onward export. Doing it this way meant that they didn’t have to pay keelmen to take the goods a few hundred yards down river (and past the restrictive bridges) to the waiting ships. Moreover, the scheme satisfied the local authorities who didn’t fancy coal wagons traipsing through the main thoroughfares of the town. The tunnel itself was driven through boulder clay, then a base and lower wall of stone was laid and a double-brick arch built – to a height of a little over seven foot and six foot wide. Loaded wagons descended the incline of the tunnel under their own weight – a total fall of some 222ft – and were hauled back using rope by a stationary engine at the head of the tunnel. At the opening ceremony eight wagons were squeezed through the tunnel to great ceremony – four containing coal and the others a “company of ladies and gentlemen and a band of musicians”. The labourious task proved to be a financial success – but the colliery itself did not. In 1860 it was closed, leaving the tunnel to collect dust for several decades. Curiously, in 1928 local brewer Thomas Moore founded the Victoria Tunnel Mushroom Company and tried to farm mushrooms in the lower end of the tunnel. However, his idea came to nothing and within a year the tunnel was abandoned once again. During World War II the subterranean space was utilised as an air-raid shelter – and benches, bunks, blast walls and chemical toilets were installed, as well as the opening up of new entrances. It was able to hold some 9,000 people. After hostilities it was once again closed to the public, though it seems that it was under consideration as a nuclear air-raid shelter at one point. 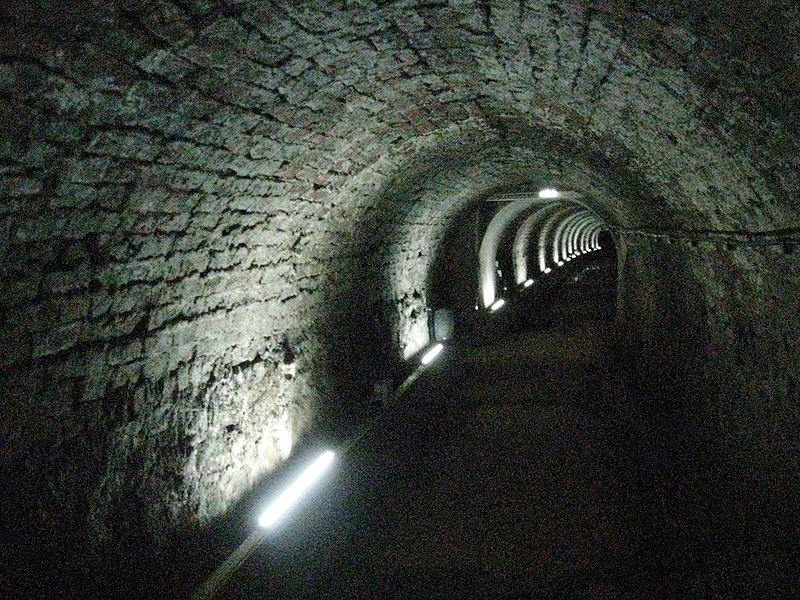 Only relatively recently has the tunnel been brought back to life – this time as a tourist attraction.